A Whole New Life is a brilliant book. Period. Lucia is a role model and awesome teacher; she's been constantly inspiring countless people (myself included) to take charge of their life and her book is the perfect companion on the road to freedom from negative beliefs, disfunctional thoughts, fears and all the bad stories and excuses we tell ourselves. Upon reading this book (and doing the exercises!) you realize you can actually change your life for the better. You will like this book and its powerful wisdom as much as I did, and still do. I am deeply in love with the road map Lucia has given to us all, thanks to it change has never been so inspiring and productive. A powerful soul with a big heart, Lucia is one woman I look up to every day. Her books have been enlightening and shall remain a source-full guidance for thousands of people around the world. Lucia has offered several courses in India, and A Whole New Life is an instant hit. It helps participants go deeper in their understanding of themselves, dissolving barriers and blocks and creating a powerful vision. Months after the seminar, participants have written to us, sharing how her techniques are helping them. It is overwhelming. Lucia’s insights and intuitive ability to understand people, creates an instant connection with her readers. Her genius lies in making complex things, simple. Her passion for creating change and her understanding of psychology comes through in every touch point. 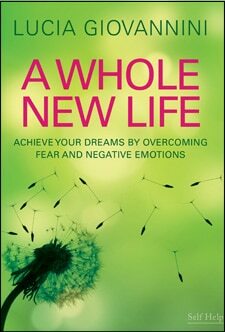 This book is truly a pathway to creating a whole new life! Great book, a true companion for life. To keep handy and pick up when you have the feeling you are losing your way or the connection to your real self, your heart, your dreams. When you stumble and need to find back your determination, your focus, your optimism, your faith in life and in you. Also, sometimes I just open it and I read a random page and there it is, the perfect insight for me, a little message for my day. I am so grateful. This book holds some potent tools for creating change in life! In 5 years from picking up this book and creating my vision map, I've changed countries twice, totally changed my career path from working in business to working in education qualifying as a trainer and teacher… am now doing a PhD!. At 47 I thought it was too late for such change….If you are thinking the same…it's not!